Ecstasy facts report that 125mg of MDMA will increase a person's resting heart rate approximately 30 beats per minute. A MAO Inhibitor is a type of prescription antidepressant. Some of the more common ones include Nardil, Parnate and Marplan. These drugs are very dangerous to combine with MDMA and can result in a potentially fatal condition known as "serotonin syndrome." A number of people have died after consuming Ecstasy while currently taking a prescription MAO Inhibitor. Also known as MDMA and XTC, ecstasy facts from scientific studies reveal that it is a mixture of psychoactive drugs containing both stimulants like methamphetamines and hallucinogenic traits like LSD. Before it was made illegal in 1985, MDMA was used by psychiatrists as a therapeutic tool. Studies are currently underway in Spain and Israel assessing MDMA's effectiveness in the treatment of Post Traumatic Stress Disorder (PTSD). 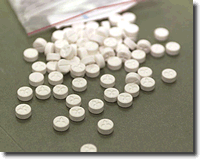 Ecstasy facts report that black market "ecstasy" tablets vary widely in strength, and often contain other drugs. Ecstasy is a “designer drug” usually found at raves — those extended dance parties that feature electronic music and high-tech light shows and often casual drug abuse. Raves are often held in large, unsupervised locations such as abandoned warehouses, parks and railroad yards, but sometimes take place in more conventional settings such as nightclubs. Up to several thousand people at a time, usually teenagers may attend and a rave can last up to two or three days. Ecstasy suppresses the need to eat and sleep, so users can endure these extended parties; however, ravers sometimes experience severe dehydration or exhaustion. Ecstasy facts note that ecstasy is almost always swallowed as a tablet or capsule. A normal dose is around 100-125 mg.
Ecstasy is illegal and a conviction for possession can carry long prison sentences. Ecstasy is MDMA, or 3,4-Methylenedioxymethamphetamine. It belongs to a family of drugs called "entactogens," which literally means "touching within." Other drugs in this category include MDA, MDE and MBDB. 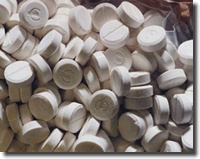 Ecstasy facts reports that this drug is not considered to be physically addictive. However, the drug can often take on great importance in people's lives, and some people become rather compulsive in their use. Taken too frequently, however, MDMA loses its unique effect. Ecstasy is one of the most popular drugs among young people today. It is estimated that more than 2.8 million teenagers have tried the drug at least once and many go on to become regular users despite the known dangers of taking it. Ecstasy facts show that ecstasy produces a significant increase in heart rate and blood pressure. This means that people with heart conditions are more vulnerable to heart attacks or other heart complications if they take MDMA. Ecstasy, like many psychoactive drugs, can exacerbate the symptoms of mental illness, particularly depression. Ecstasy facts reports that frequent or high doses of Ecstasy have been linked to neurotoxic damage in laboratory animals. It is still unknown whether such damage occurs in humans or, if it does, whether this has any long-term, negative consequences. MDMA is a "mood elevator" that produces a relaxed, euphoric state. It does not produce hallucinations. MDMA releases the brain chemical serotonin, elevating mood and acting as a short-term antidepressant. Compulsive users may be unconsciously trying to self-medicate for depression. Ecstasy facts have shown that MDMA takes effect 20 to 40 minutes after taking a tablet, with little rushes of exhilaration which can be accompanied by nausea. 60 to 90 minutes after taking the drug, the user feels the peak effects. Sensations are enhanced and the user experiences heightened feelings of empathy, emotional warmth, and self-acceptance. 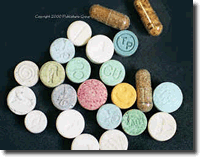 Mixing ecstasy with alcohol or other drugs increases the risk of adverse reactions. Today’s Ecstasy facts notes that much of what is sold as "ecstasy" on the black market actually contains other drugs, some of which can be more dangerous than MDMA, like PMA, speed, DXM and PCP. Not everyone who goes to a rave takes ecstasy, but many do. If you go to a rave, it is very likely someone will at least offer you some ecstasy. People who sell ecstasy will tell you it is harmless. They say ecstasy makes you calm, heightens your perceptions and makes you feel happier. And for a short while, you might. But drugs provide fake happiness and in the end, you will be far worse off in every area of your life. Ecstasy facts points out that over 100 people have died after taking ecstasy at rave parties. Some drugs are metabolized (broken down) through the same liver enzyme as MDMA, known as the CYP2D6 enzyme. If a person takes ecstasy along with another drug that is metabolized by the CYP2D6 enzyme, they will both be metabolized much more slowly, as the same enzymes struggle to break down two drugs at the same time. It is like taking a higher dose of both drugs, and this can be dangerous, especially if the other drug has a low overdose threshold. Drugs metabolized by CYP2D6 include codeine and other opiate derivatives, as well as DXM, an ingredient found in many over-the counter cough medications. Ecstasy facts show that some people experience depression after taking MDMA. This is caused by MDMA's action on certain brain chemicals. The effect that makes MDMA different from other drugs is empathy, the sensation of understanding and accepting others. The effects of “genuine” ecstasy subside after about 3-5 hours. There are some diseases, like Central Core Disease, that make people more susceptible to heatstroke. Another name for this kind of heatstroke is "malignant hyperthermia." MDMA raises the risk of malignant hyperthermia in people with Central Core Disease. Ecstasy facts mentions that there have been a few deaths reported from people drinking too much water while at a rave. This is extremely rare. However, drinking 2-4 cups a hour when dancing is about the right amount. A person on ecstasy should also try and eat something salty (not always easy if you've taken a stimulant drug) or drink fruit juice or a sports drink like Gatorade. 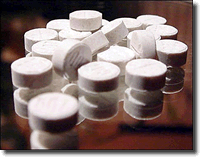 There have been some deaths associated with MDMA. Usually these have been a result of heatstroke from dancing for long periods of time in hot clubs without replenishing lost body fluids. When you take ecstasy (or any stimulant drug) your body temperature rises. When you take ecstasy in a hot place (like a rave) your body temperature rises even more. When you take ecstasy in a hot place and start dancing energetically, your temperature rises even more again. With body temperatures raised to these very high levels there is a risk of developing heat stroke. Ecstasy facts show that when your body overheats you lose fluid. Some ravers lose pints and pints of fluid when dancing on ecstasy in hot places. At a crowded indoor rave you could lose up to 6 pints in 6 hours! These cases are not ecstasy overdoses. Heatstroke can happen even if the user has only taken one tablet.